While you can’t control the mood of your customer as they walk into your store, you can influence their mood for the better before they leave. You see, it’s the little details that set great retailers apart. Whether or not your customer comes in with a smile, it’s up to you to make sure they leave feeling satisfied and with a positive impression of your brand. Our customers will often notice things about our stores that retailers completely miss themselves. How functional and easy to navigate the store is a big one. We all know the frustration of rummaging for your keys or wallet just before you leave. Not being able to find something you’ve been looking for can turn even the calmest of people into a grumpy toddler on the verge of a breakdown. This is the last feeling you want to evoke in your customers while they’re browsing the aisles of your store. How easy it is to navigate your store and the different departments is a crucial factor in a customer’s satisfaction with their shopping experience. Retailers need to ensure the layout of their stores are simple and similar, if not identical, to each other. Online retailers today can offer customers a convenient and personalised shopping experience by utilising technology to enhance their customer shopping experience, such as Amazon recommending books based on your search history. While there is no way to cater to a customer’s preferences as they walk into a store, there are other ways physical retailers can embrace technology to better their approach to customer care. It can be as simple as having tablets on hand for customers to search the availability of items directly from the store. If your store runs out of a certain size or colour of a particular product then a staff member can order one in right in front of the customer, proving to them that your store is willing to go above and beyond to meet their needs. It’s funny how your customers will notice things about your store that you as the owner would completely miss. In Customer Radar’s early days, we had a client running a hair salon whose feedback revealed that they had a dirty ceiling that had gone completely unnoticed by staff but customers lying back to have their hair washed certainly saw it. If they hadn’t asked their customers for feedback, they may not have noticed for months. Without cleaning the ceiling this could have continued to bring the cleanliness of the salon into question – luckily, the remedy was very quick and easy. So how about online? Customer experience isn’t only relevant to brick & mortar stores after all. Adding a chatbot to your website is an easy way to improve your online customer experience. Customers can get instant answers catered to their specific questions and queries. Makeup brand Sephora has an outstanding chatbot service that allows customers to outline their makeup needs by answering tailored questions before arranging a makeup appointment at the closest store available. Sephora noted an 11 percent increase in appointments made after introducing their chatbot service. Making your customers feel listened to is so important for building brand loyalty and considering all the little enhancements technology offers can go a long way towards improving your customer care. However, above all, the factor that consistently trends highest in our clients’ customer feedback is staff. Your team’s training, attitudes, processes, and overall service have a massive impact on the overall shopping experience – more than anything else. There are so many little things your staff can do to make your customers feel valued, and it all begins with the training. You can tell a store has well trained staff that truly care because of the high satisfaction scores we see. Encourage your staff to make it personal by remembering the names of regular customers or their coffee order. Have enough staff rostered on to keep queues moving quickly. If parking is inadequate, make it a staff practice to offer to help carry heavy purchases out to your customers’ cars. Provide an in-store expert to help customers set-up new devices or answer specific product related questions. Consider how your store can appeal to the 5 senses of customers. Is it designed to be bold and eye catching, or soothing and relaxing? Things like the music you play and the visual aesthetic you create can play a huge role in the overall vibe of your shop. Retailers should be focusing on all the little details that make or break your customer’s shopping experience. Building that crucial customer loyalty will require going above and beyond and considering all the little factors that set a great customer experience apart. 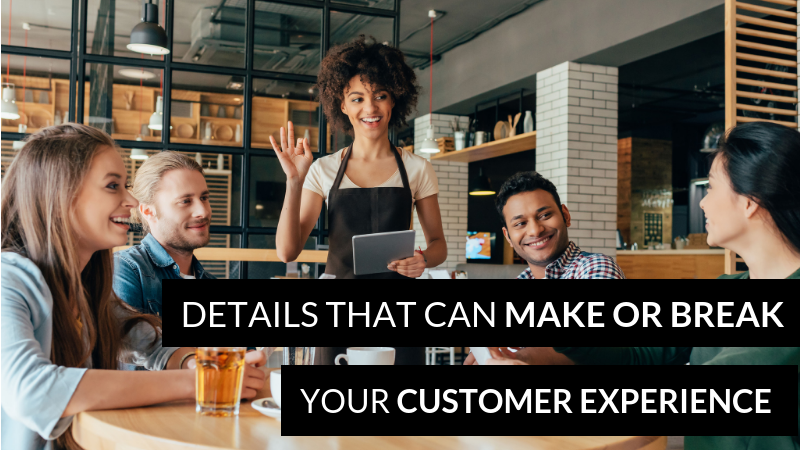 Whether it's improving how your store functions, changing how you listen to or interact with customers, or the training of your staff, enhancing your approach to customer care is all about the little details. Need to know more? Download our free ebook ‘The Ultimate Guide to Engaging With Customer Feedback’.